Wendy Parraga, a Sunset Park mom, has started up a NYS registered family day-care. 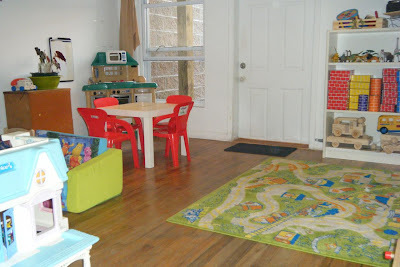 She has an amazing space with a structured and creative curriculum set-up; you can see it here. Ages 2-4.5 are accepted, and children need to be at least 3/4 of the way to being potty-trained. (I'm guessing that means day-time trained!) Sunflowers Family Day Care opens at 8 AM and has dismissal at 6 PM, so there is a good amount of flexibility. I don't know if there is a "late-pick-up" or "early-drop-off" policy, but one could always ask. The 57th Street location is relatively convenient to the 59th Street express stop for parents who work outside of the neighborhood. See the contact information below. As a mother of an intelligent and very verbally expressive child, I was searching the neighborhood for a suitable daycare or nursery school. i wanted a clean, above-ground space with a backyard, plenty of kid friendly materials, and most importantly caring, nurturing, qualified, energetic teachers with up-to-date teaching practices. Unfortunately, there was no space for my child in the daycare centers I found suitable in the neighborhood. As an education grad student with a career in education, I truly believe the early years are extremely important. I am dedicated to my young son and to young children. I saw a need for early childhood education services in this neighborhood and I knew I was not the only one seeing this need. If you are interested and would like more information, please visit www.sunflowerslearningfdc.com or call 347-210-1091 and ask for Wendy. We have part-time (2/3 days a week with 3, 4, 6, or 10 hours) or 5 days with 3, 4, 6, or 10 hours a day. Wow, sounds like a nice woman but it's pretty odd to use Sunflowers when there has been a series of Sunflowers for more than 10 years in the area. Why not create your own identity? The Sunflower daycare is responsbile for at least 10 years worht of happy, loving Brooklyn kids. Its a small chain of homestyle daycares in Carroll Gardens and Windsor Terrace that have cared for 100s of happy babies and toddlers. Not affiliated, just had my son there happily for 4 years. I think that "sunflower" is a pretty common theme in day care and preschool. There is another similarly named daycare in Bensonhurst. Hopefully this day care will provide a much needed option with as much quality as the spots you mention to parents in this area. Well done. I think you are doing a great work. Williamsburg Northside Schools also provides amazing day care programs as well as a nurturing environment to children. For more information, please visit www.willnorth.org.